FRESNO – The Big Fresno Fair was recently honored at the Western Fairs Association’s 91st Convention & Trade Show, in which roughly 125 fairs from throughout the Western United States attend to gather new ideas, attend seminars and participate in the annual Achievement Awards. The Achievement Awards recognize the very best efforts that a fair puts forth for its community. This year, The Big Fresno Fair received 18 Achievement Awards, plus an Honorable Mention recognizing everything from the Fair Theme Logo to its 4.0 & Above Scholastic Achievement Program. 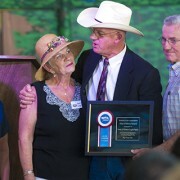 During this year’s WFA Awards Program The Big Fresno Fair competed against other top fairs within the Western United States including Alameda County Fair, California State Fair, Orange County Fair, San Diego County Fair, Washington State Fair, Arizona State Fair and Calgary Stampede. The Western Fairs Association, a non-profit trade association serving the Fair Industry throughout the Western United States and Canada, offers an Annual Achievement Awards Program to recognize excellence and to share successful fair ideas and programs.